부에노스아이레스에 방문하실 때, Babel Palermo에서 집에있는 듯한 편안함과 그에 맞는 최상의 서비스를 느껴보세요. 이곳에서 생생한 도시의 모든것을 쉽게 즐기실 수 있습니다. 호텔은 이스파시오 옥시비탈, 쿠라타 도조, 프로옉토 아트 같이 셀수 없이 많은 관광지에서 한 걸음 움직이면 편안한 휴식처가 되어 주는 곳입니다. Babel Palermo에는 다양한 시설이 있어 부에노스아이레스에서의 시간을 풍요롭게 해줍니다. 호텔에서는 전 객실 무료 와이파이, 장애인용 편의시설, 익스프레스 체크인/체크아웃, 여행 가방 보관, 주차장 등을 포함하여 손님들을 위해 최고의 편안함을 제공합니다. 최고 수준의 객실 시설 및 최상의 편리함을 약속해 드립니다. 일부 객실에서는 월풀욕조, 에어컨, 난방, 모닝콜 서비스, 책상 등을 제공합니다. 온수욕조, 골프장(3km 이내) , 실외 수영장, 일광욕실, 놀이터 등을 포함하여 완벽한 여가시설이 구비되어 있는 호텔입니다. 부에노스아이레스의 방문 이유와 상관없이, Babel Palermo 숙박시설은 아주 신나고 흥미로운 일탈을 즐기실 수 있는 완벽한 장소입니다. Love the split level room, very New York. Staff were nice, place is very secure and quiet. Our stay was good overall. WE however think that 4 stars is too much for this hotel, as the lounge was not clean and our sofa was broken. The floor in the toilet downstairs also didn't look clean. But the receptionist's work was outstanding. Javier is very welcoming and helpful. When we arrived in Buenos Aires, we had no idea about the 'blue' rate of exchange. The staff at Babel Palermo guided us really usefully on this, and also made some calls to help us sort out our money issues. When we got into language trouble away from the hotel, they even didn't mind us calling them up to translate! We also loved the huge, comfy bed in the room. There wasn't any food available at the hotel, though. As it was a required field in the ratings section above, I marked it in the middle. Love staying there as the room was nice and very clean. People are friendly and very helpful. Plus they speak English too. Noa Noa Lofts is located nicely in terms of restaurants and night life. Staff is friendly and helpfull. The loft accomodates 3 people and is spacious with a nice balcony. Clean and tidy, - good value for money. 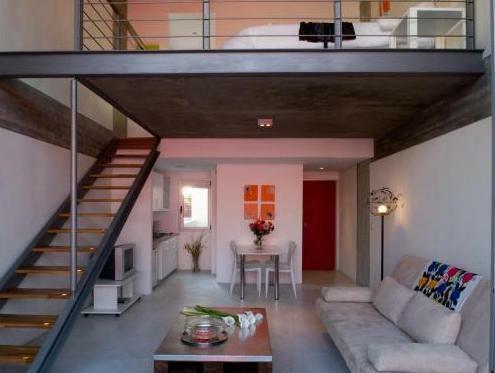 We can highly recommend Noa Noa Lofts for a couple of days in Buenos Airea. Noa Noa Lofts is a wonderful, private, studio loft hotel in a great location in Palermo. Rooms are very tastfully appointed with modern design. Our room overlooked the pool area, which itself looks like a David Hockney painting. The staff was great, accomodating every need we had. Our room was a spacious studio with a large balcony and full kitchen - plenty of room for the two of us to spread out. It was a great value for our money and within walking distance of awesome restaurants and other attractions, including the market at Serrano Plaza. we had been staying in hotels for a few weeks so we were ready to stretch out in something roomy. noa noa lofts was perfect for this. our adult son had privacy and so did the parents (us). the apartment is modern and you can cook a basic meal in the kitchen. breakfast is delivered on a tray at the time you ask. diego at the front desk is really helpful, organised airport transport for us and kept our bags safe for the day after check-out. the palermo area has lots of great restaurants in easy walking distance.we would stay here again. Tiene al lado unas casas un poco feas de vista pero solo se ven cuando se sube a la habitaciòn. La pasamos muy bien en el Noa Noa. Es un hotel tipo Loft. La habitacion estuvo comoda. Lo unico que no tenian cable cuando estuvimos pero lo estaban por arreglar.